“Please ask the photographer to move away. He isn’t helping the cause”, I told the coordinator. The press reporter who was standing right beside me, looked perplexed at my suggestion. “This is how it is done. If we do not get the photos, we cannot sell the message”, she said. People do not know the etiquette of a candle light march, she tried convincing herself. 24 hours after the candle light march held for Manjunath Shanmugan in college, I still struggle to find some answers to the questions that boggle my mind. The conversation between me and the reporter happened at a time, when we students were lined up with candles in our hands and the photographer was making some of us pose for the perfect shots. Manjunath stared at us from his photograph, which we had managed to print from the hostel printer. He is long dead. 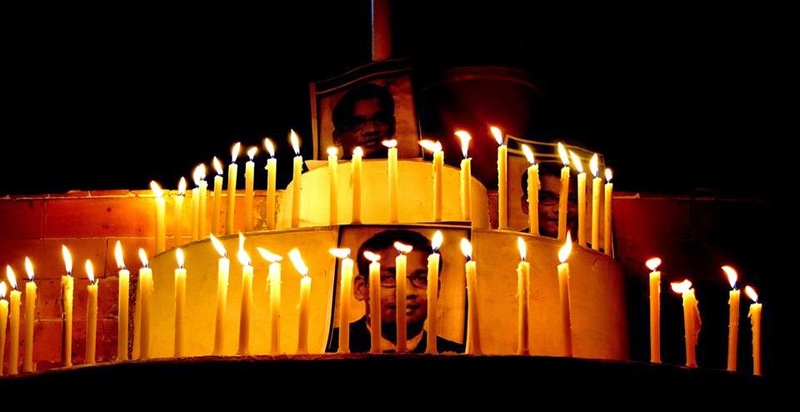 Today is Manjunath’s birthday and that is why we are walking with candles in our hands said one of us. No, today was the day his killers were hanged said the other. No, today is the day he was shot dead came in another voice. We had all marched with candles in our hands because we were in a B-school and ‘humko kuch social types karna hain’. None of us knew why! I first heard of him on TV when the news reporter announced, “IOC manager from Karnataka shot dead in U.P” in 2005. I was in class 11 and the only news channel that I had access to in my dormitory’s common room was Doordarshan news. Right after dinner, we a group of friends used to gather in the recreation room, as it was called, to get the latest updates from, yes, Doordarshan! Also, the anchor who read the news was cute. But that’s not the point. I was surprised as well as angry at the news that day. The next day’s newspaper carried the whole story. Manjunath Shanmugan’s father worked in the BEML factory at Kolar Gold Fields and he grew up in the town of Kolar. Later he graduated from SJCE Mysore, the place I was in while reading the newspaper. He went to IIM Lucknow, the place I thought I would go while reading the newspaper and later shot dead for being upright and honest. For a moment, I shuddered at the thought of- what if it was me? And then forgot all about it. Perhaps, that was the easier thing to do. Over the years, all I can claim to have done is signing change.org petitions for punishing Manjunath’s killers and writing letters to the editor. I don’t know if I have become more honest. May be I didn’t. Okay, I’ll admit it, I haven’t. Is it because of the fear of being shot dead like Manju, as he was affectionately called? Why was he shot dead? Oscar Wilde, a witty man he was, once wrote- “Be yourself. Everybody else is already taken.” Manjunath Shanmugan was just being himself. As an Indian Oil Officer when he got to know the rampant oil adulteration market in Lakhimpur-Kheri, one of the largest districts in the hinterlands of Uttar Pradesh, his assigned area of operation, he couldn’t live with it. He escalated the issue to his Area Manager in Lucknow. But some people learn to live with their pricky conscience. But again, Manju wasn’t anybody else, he couldn’t be anything but himself. Perhaps he tried. He tried and failed. Working on the field for 2 years, he had by then known, anybody who blows the whistle would be shot dead. Guns were cheaper than human souls, anyways. But then, Majunath Shanmugan just couldn’t be anybody else. On the 19th of November 2005, Manjunath went on his routine check of petrol stations. In the village of Gola Gokarnnath, a petrol station which he had ordered to be shut down, was open and running its operations. On enquiring Pawan Kumar, Monu as he was called, the owner of the petrol pump, told that he had secured the permission and he has the licence to run. When Manju went in to conduct the adulteration check, a verbal battle ensued and a half-drunk Monu fired a bullet in Manju's stomach. He collapsed. Arey aise nahi chod sakte, poora maar do isse! Screamed one of his aides. The next morning Manjunath’s body was found in the backseat of his car, with 6 bullet wounds. In July 481 B.C, the Oracle of Delphi told King Leonidas, that in the next war with Persia, either the king would die or Sparta will be destroyed. We all know what happened next, Leonidas chose to die to save Sparta. Manju chose to die, not because he thought he would eradicate corrupt practices, but he thought that was the right thing to do. In that petrol station, if he had budged and walked away, he wouldn’t have had a happy sleep. There are some things that are right, some things that aren't. People like Manju see it clearly as Black and White. People like us who hold candle light marches, look for the grey areas. But then as managers, we are told to look for the grey areas. Yes, surprisingly that is where you find the majority if you draw the bell curve. The killer Pawan Kumar's death sentence delivered by Lakhimpur Kheri Sessions Court, was reduced to life imprisonment by the Allahabad High Court. He has appealed again to reduce his punishment further in the Supreme Court of India. Manjunath Shanmugan trust, founded by IIML alums, is fighting the legal battle on behalf of Manju. It's been 9 years since that fateful day when Manjunath chose not to compromise with what he thought was right. It's been 9 years since we have forgotten Manjunath, except on 19th November where we remember him sometimes, thinking it's his birthday! Fyodor Dostoyevsky, perhaps the greatest philosopher writer of modern times, said- “Nothing in the world is harder than speaking the truth, nothing easier than flattery.” Manju spoke the truth. What we did there in the candle light march was flattery.